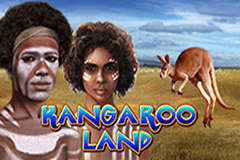 Themed around the Australian Outback, the Kangaroo Land video pokie from EGT should have plenty of players hopping over to it, hoping to land bonus features like free spins and the chance to claim a progressive jackpot. Beautifully drawn images of the local wildlife and native peoples of the land are supplemented by high-card symbols, all lining up across 5 reels and over 20 paylines to create wining combinations. The Red Centre sits behind the reels, and at the top of the screen, there’s the 4 levels of the Jackpot Cards progressive feature, where players win either the Club, Heart, Diamond or Spade prizes in a randomly-triggered round, while at the bottom, there’s the standard set of control buttons used across the EGT range of online casino games. These give payers the choice of bet sizes from as little as 0.20 to a high limit of 40.00 per spin, while there’s also the option to set the game running on Autoplay, or even a chance to try free Kangaroo Land video pokie games, just to test it out if required. The Outback theme has been done before, but usually in a cartoon format, so a game where the symbols are realistically depicted is a refreshing change and could have players coming back to it again and again, boomerang-style. Although the lower-value half of the pay table is taken up with playing card symbols, they have all been given an attractive Aboriginal artwork style. A review of what each is worth reveals that the 10, J, Q and K will each pay out 5, 20 or 100x the line bet when matching symbols land on 3, 4 or 5 connected reels, across a payline from the left side. The A is worth a little more, but the bigger wins come from the unique picture symbols, starting with a platypus and cockatoo, each of which returns wins of 20, 100 or 200x the line bet, while an emu or koala bear across a payline will be worth 30, 125 or 350x. An Aboriginal woman will only need to stop on reels 1 and 2 to be worth 5x the line bet, with wins of 40, 350 or 500x paid out when she’s on 3, 4 or 5 at a time, while the Aboriginal man is even more valuable, paying out anything from 5 to 1000x for the same combinations. What Outback-themed game would be complete without a kangaroo? Certainly not one called Kangaroo Land, that’s for sure, so here he is, bouncing onto the reels as the games’ wild symbol, meaning that he can substitute for any other, apart from the scatter, and therefore complete winning combinations, either filling in the gaps in a line, or turning a line of 3 into a higher-value line of 4. It’s a stacked symbol, filling the reels it lands on, which makes it a bit easier to complete lines. He will only land on the middle 3 reels though, so isn’t able to make up a winline on his own. The reason he can’t substitute for the scatter symbol of a boomerang is because this is pays out the best wins of the game when landing in any 3, 4 or 5 positions at once and also triggers a free spins game. Once the payouts of 100, 400 or 2000x the line bet for 3, 4 or 5 scatters have been awarded, 15 free spins will begin, with any wild symbols filling a reel being held while a further respin of the others takes place. If this respin sees another reel filled with the kangaroo, yet another spin is awarded, potentially a number of times over. The bonus spins can be retriggered by 3 or more scatters and 15 additional games are added on. Like all EGT online pokies, there’s the option to gamble wins up to a certain value, in this case anything less than 700 coins. Players need to correctly pick if a playing card will be a black or red suit, doubling the win if they are successful and losing it if they get it wrong. There’s also the Jackpot Cards progressive round that’s triggered at any time and takes them to a second screen where 12 face-down cards are shown. Once 3 of the same suit have been found, the jackpot connected to the suit is awarded, and once the round starts, a win is guaranteed. This good-looking online casino pokie machine has plenty of visual appeal, but also some decent features. Stacked wilds, high-paying scatters and free spins with the potential for extra respins are enough to make Kangaroo Land a potentially very rewarding pokie, although unfortunately it’s not mobile-optimised.